Today begins a new phase of Metahammer. This place has been pretty random and it’s time to get organized. I will still be blogging about virtual reality, art, ideas, etc., but I will also be reviewing specific (mostly virtual) products and writing essays to explain some of the peculiarities of scripting and building in SL and similar worlds. You can select a tag to sort the posts according to your interests. DISCLAIMER: Everything I say here is my personal opinion and you are free to disagree with me. Let me know if anything I say is technically incorrect or otherwise misinformed. I’ll try to correct verifiable factual errors, but I’m not here to debate aesthetic preferences or ideas that can’t be substantiated. I will be reviewing the products of instrument makers in SL. I’ll give the makers opportunities to respond to my reviews and they may even offer specials for my readers. I’m willing to be corrected if I’ve erred and I may be influenced by a maker’s preferences about which objects I review. (E.g., if they know of problems and are about to release a revision, it’s only fair to wait.) I may accept review copies of products if offered. But I will review products from my own perspective as a musicologist and as a maker, and user of these products. These will be critical reviews and not fluffy promotional pieces. I’m not a master scripter, but I’ve learned a LOT in the last three years or so of building objects in SL. Every time I learn something new, I feel like it could have been explained a lot better in the online resources. So my hope is to take certain processes and to illuminate them as clearly as possible with the simplest of examples, assuming the reader has almost no experience with Linden Scripting Laguage (or any of its metaversal variants). My hope is to end up with a nice collection of examples and code snippets that anyone can use. This is a catchall for anything I happen to find interesting at the moment. It may include previews or reviews of virtual arts events, as well as conversations about the meaning of virtual life. Why do we care about learning? What makes us curious? Is curiosity a survival trait? What is it that thrills us when we learn something that shakes our understanding of reality? What are the odds that a species would evolve to become conscious of self, of others, and of the farthest reaches of imagination? Animals display curiosity and even learn from experimentation, but (with some less notable exceptions) they generally do not pass that learning on. The ability to communicate learn complex ideas from others who already did the work of discovery is key to evolution and separates us from other animals. We all begin life as tabula rasa. But we don’t each have to learn about gravity and atoms and galaxies from nothing. We don’t each of us have to find a Northwest Passage. We bypass millennia of discovery by learning from those who have gone before. That we can hold in our minds a reasonable model of events happening billions of light years away is a remarkable thing. There is theory that suggests that ideas themselves are reality. That what we perceive as physical reality is a projection into three dimensions of a larger holographic reality. The coalescence of an energy field or something that we interpret as physicality, even as self. This coalescence that I interpret as being “me” forms, interacts, resonates, combines with other coalescences in a continuous stew of learning. Information theory suggests that as things become more complex, they become more chaotic and less meaningful. Too much information is indistinguishable from noise. As we grow and learn we reach higher levels of energetic complexity. Perhaps this is a model for life and death. Complexity becomes so great that systems become less able to communicate meaningfully–in effect they are less able to understand. The coalescence dissipates and is subsumed into the roiling chaos of generality, perhaps to refocus somewhere else. The MacArthur Foundation will have a “sneak preview” of a new SL sim featuring MacArthur programs and grantees. Sponsored also by the USC Network Culture Project and Global Kids. The event will be held Monday, Nov 17 from 1-5PM, PST(SLT). Please read the original post at the Journal of Virtual Worlds Research events blog for details and SLURLs. Included will be ways virtual worlds are being used by marignalized populations, native peoples, people with disabilities, etc. This promises to be an important event relating to community issues, activism, and education. I recently completed a large project for the Port Spinoza learning commuity in Second Life. Port Spinoza is a brand new sim dedicated to individual and group learning in SL. It’s physical and philosophical model is the Netherlands in the Age of Enlightenment, when reason and critical dialog emerged as intellectual processes for understanding reality. The community seeks to find residents who are similarly interested in personal growth and collaborative work with learning (broadly defined) as the goal metronidazole flagyl. Jon Seattle, founder of the amazing Cedar Island group, has established the two new sims (Port Spinoza and Spinoza South) across a pair of openspace sims separating it from the Cedar Island/Sea Turtle Island sims. There promises to be a close relationship between the communities as a number of the members of Spinoza are current or former members of Cedar Island. In both cases, the residents are required to participate by attending events and making presentations or other activities for the communities to experience. Both are governed using a Quaker consensus process with a residents’ council of the whole making all major decisions. Jon has generously supported Cedar/Sea Turtle and has underwritten the new development as well, though there is a nonprofit educational partner in the new development. Nearly all of the building on both developments is the singular work of Jon, but the Spinoza project has involved a number of other builders as well, working closely with Jon to assure a consistent and appropriate appearance. Jon has always been very supportive of my building work. He asked me if I’d like to build a “museum” in the new project. He gave me a budget of like 1500 prims or something, which is a much larger project than anything I’d tried before. The opportunity to build a major public building in the new developent was too good to pass up. I’ve taken a townhouse across the canal from the museum as my new home base, having resigned from the Cedar community to concentrate on helping to launch Spinoza, so I expect to tweak the silly thing for the rest of my life there. My original thought was to do a reasonably accurate reproduction of an historic building in Amsterdam appropriate to the Age of Enlightenment. 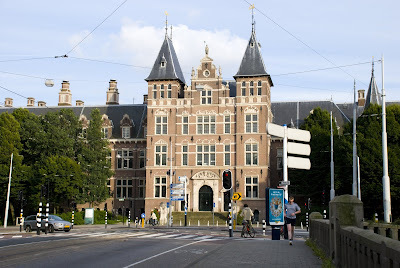 My first thought was to choose Amsterdam’s Royal Palace building (now a museum), which is a big, square, neoclassical structure. I did a rough draft on the parcel in near full scale. It wasn’t real pretty. But Jon had something else in mind. He suggested the Tropenmuseum, a 19th century(?) building now housing a large anthropological museum, as a model. While it is not a historical building in the same way as the palace, it blends much better with the architectural style of the rest of the development. Since we decided to go with something not entirely historical, I felt more at liberty to also vary the layout and details to make it all more buildable in prims and without using photographic textures of the actual building. The main challenge on this build was keeping prims in check without using giant prims. The structure is basically a big box with a main floor with an atrium and a grand stair leading to a mezzanine. This gives a lot of floor space without making it feel closed in. I’m very happy with the openness and light in the space. The slightly asymmetrical tower entrances that jut out a bit from the box made for a lot more prims than would otherwise have been required. But probably the most extravagant part are the lines of corinthian columns inside. 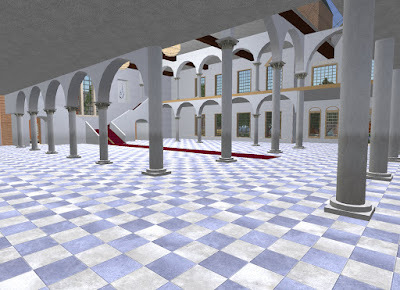 Each column is eight prims, largely due to the capitals which use alpha textures in a way similar to plants and trees, and there are 30 of them. My usual building process is to throw together a rough draft to get a sense of scale. In this case, I made a texture using an image of the actual Tropenmuseum building. The key features are, of course, the towers. Once I had that section set up to scale, the rest developed fairly organically. I had to rework things a couple of times to make the most efficient use of prims, but the end result is still right around 1100. The most tedious part is aligning prims and textures to a microscopic degree. Most of this can be done by the numbers, but it’s still a chore that took a good deal of time. To keep things as simple as possible, I used only a few textures in the whole build. Jon provided the brick for the outside and the interior walls are all a standard white paint texture that is used commonly on the sim. I’ll be happy to give you a tour or answer questions about the build. Just IM Oriscus Zauberflote in world. For lots more pictures of the build, see my Picasa album. There are all kinds of hammers for all kinds of jobs. There are sledges, ball-peens, roofing hammers, claw hammers, finishing hammers, tack hammers. Rubber mallets. Two ounce jeweler’s hammers and twelve pound mauls. And what about nails? Brads, ten penny sinkers, roofing nails, finishing nails, tacks, and my favorites: gutter spikes, coffin nails, and escutcheon pins. But hammers aren’t just used on fasteners.You can use them to bash things together, bash things apart, or just give something a tap of friendly persuasion. And you can play music with them! A piano has 88 hammers that are flung against strings to good effect. Percussionists are professional hammerers. Their arsenal of mallets, both hard and soft, could make a mere cabinet maker weep. OK, hammers are all about using their mass and momentum to bully something into happening on impact. Maybe not always the best solution to every problem. But the point is, sometimes you find a really useful tool with lots of complicated parts and fine adjustments that does a certain job superbly well. And sometimes you just need to hit it with something. We’re definitely not advocating a brute force approach to problem solving. What we want to emphasize is tools and resources that have impact. (Ah! There’s the point!) What is a virtual hammer? It’s a script or a tool or a piece of software or an idea or… anything… that is so interesting and useful that it can have impact on what we do or, if we’re really fortunate, on how we think. When I come across something like that, I want to share it. So here it is. MetaHammer is about tools and resources for working in the virtual world. My experience so far is almost exclusively in the world of Second Life, so most of what I have to say here is related to that environment. But my expectation is that SL will become decentralized as open source alternatives and accretions emerge and as it and other virtual worlds begin to cross borders. I’m taking the long view that tools will always be in demand, no matter the context. Comments and recommendations are welcome.